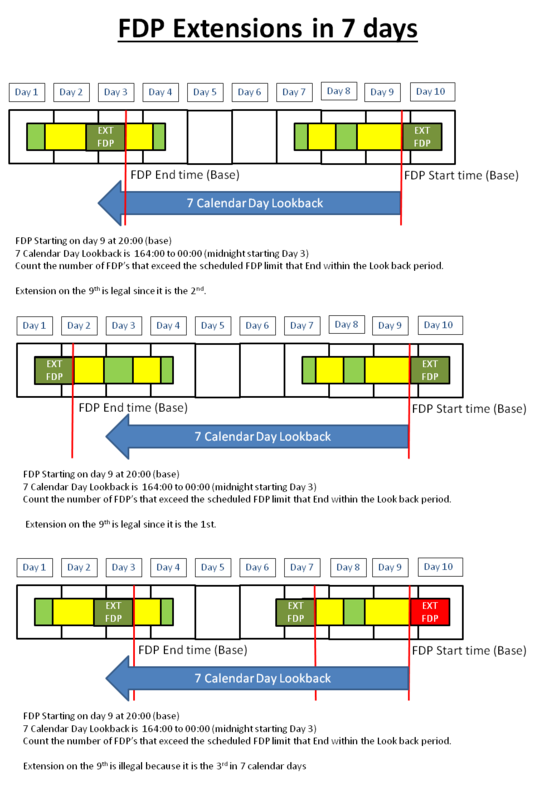 Use the start time of the FDP (Adjusted to Reference Time Zone) and apply the number of sectors within the FDP. Should be done for each sector (Leg). Maximum Scheduled FDP in RED. Apply the number of sectors within the FDP. The maximum number of sectors is 8. Authors Note: It is important to calculate the scheduled FDP limitation with each leg, as this determines when a leg is operating under extended FDP limits. The Applied Difference is calculated as FCM Report Time – CCM Report Time. The Applied Difference shall not exceed 1 hour (1:00). The CCM FDP starts at CCM Report Time. The reference time used with FDP Table above is the CCM Report Time plus the Applied Difference in Report Time. The FDP must contain a break on the ground of no less than 3 hours (3:00). Is only applied as an extension to the Scheduled FDP Limits in ORO.FTL.205(b). 50 % of the break which does not encroach the WOCL or. The crew member is in an unknown state of acclimatisation. Split FDP values in RED. The maximum planned extension is 1 hour (1:00). May not be used if the FDP is a Split Duty ORO.FTL.220. A Planned Extension is permitted when it is the 1st or 2nd extension of a FDP in any 7 calendar day period. 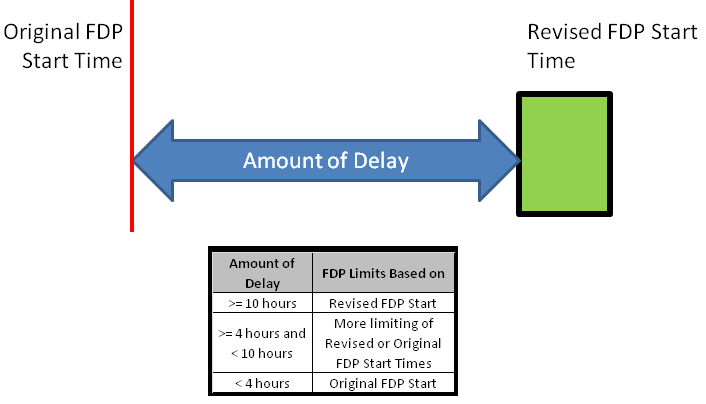 In the case where 2 FDP extensions are planned for consecutive FDPs the additional rest must be applied to both FDPs. Maximum Planned FDP Extensions in RED. 2 consecutive hours for the flight crew members at control during landing. The extension up to the Maximum extended FDP, provided each CCM is provided an inflight that meets the values in the following Table:. Extensions under ORO.FTL.220 Split Duty, ORO.FTL.205(e) – Inflight Rest, ORO.FTL.205(d) – Scheduled FDP Extension, are not permitted to be used together. The maximum planned extension for standard flight crew and standard cabin crew is 2 hour s (2:00) above the scheduled FDP limits in ORO.FLT.205(b). The maximum planned extension for augmented flight crew and augmented cabin crew is 3 hour s (3:00) above the scheduled FDP limits in ORO.FLT.205(e). May continue as long as necessary to land at the next Destination / Alternate Aerodrome. 1000 hours of flight time in any 12 consecutive calendar months. As we can see in the example above, The planned Duty Periods and FDPs and the Rest Requirements are legal. Example #2: Reduced Rest Away From Base. Example #2, illustrates what can happen to Example #1 if the 1st Duty Period experiences a Delay of just 1 hour. FDP #2 will require a reduction down to 10:00 and Rest Period #2 will require an increase to 13:00. 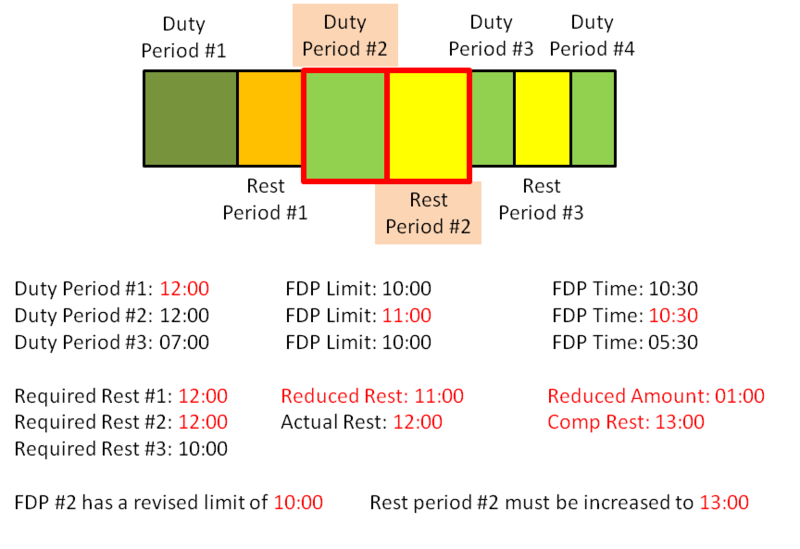 Should Duty Period #2 be re-scheduled to have a duty time of only 11:30 and an FDP of 10:00 the Comp Rest after Duty #2 becomes 12:30 and the Actual Rest also increases to 12:30. Reduced Rest is only permitted under an approved FRM. An ERRR is at least 36 hours (36:00) and includes 2 LNR. the end of one ERRR to the start of the ERRR. Each Crew member must be given twice a month, ERRR that includes two (2) local days. least as long as the preceding duty period, or 14 hours, whichever is greater. This rule is applied only if the operator is not furnishing a suitable accommodation at base. Example: CM has flown to a time zone 7 hours away from home base and has been away from home base 65:00, upon return the CM will require a rest period that includes 3 LNR. One pairing will more than +2 hours from home base while the other pairing will be more than -2 hours from home base. 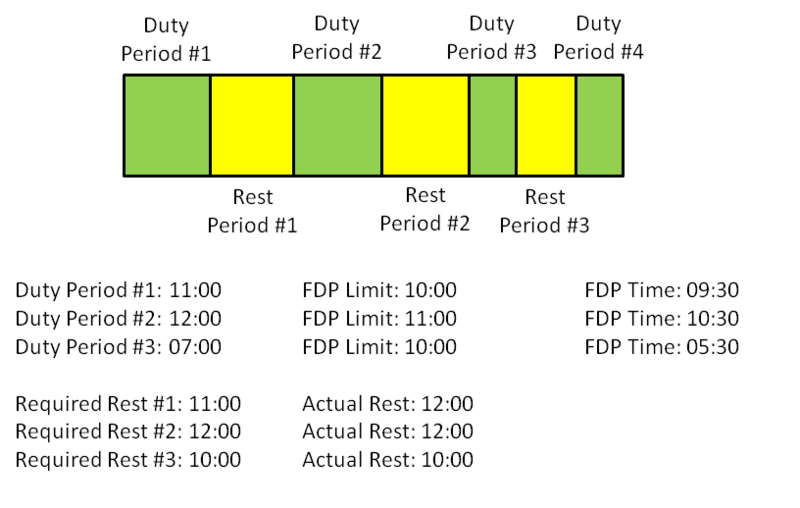 If a FDP involves a 4 hour time difference or more the minimum rest following that FDP is at least as long as the preceding duty period, or 14 hours, whichever is greater. Takes into account the amount of the delay and the number of notifications. 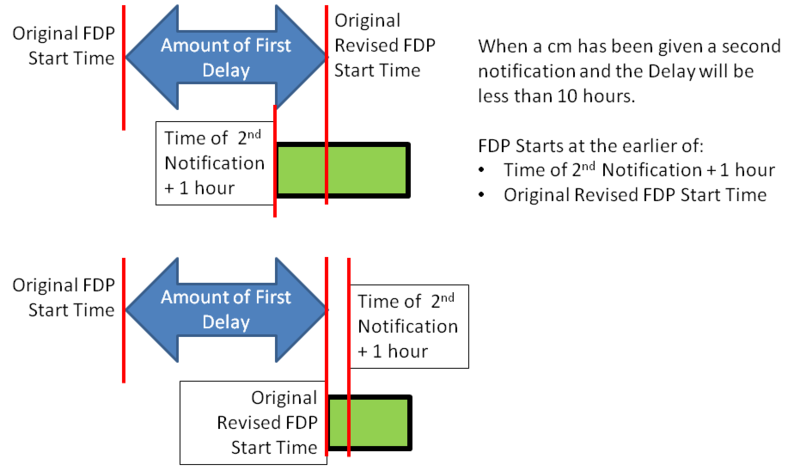 With a Single Notification or a Delay >= 10 hours, the Actual FDP Start Time is at the Revised FDP Start Time. 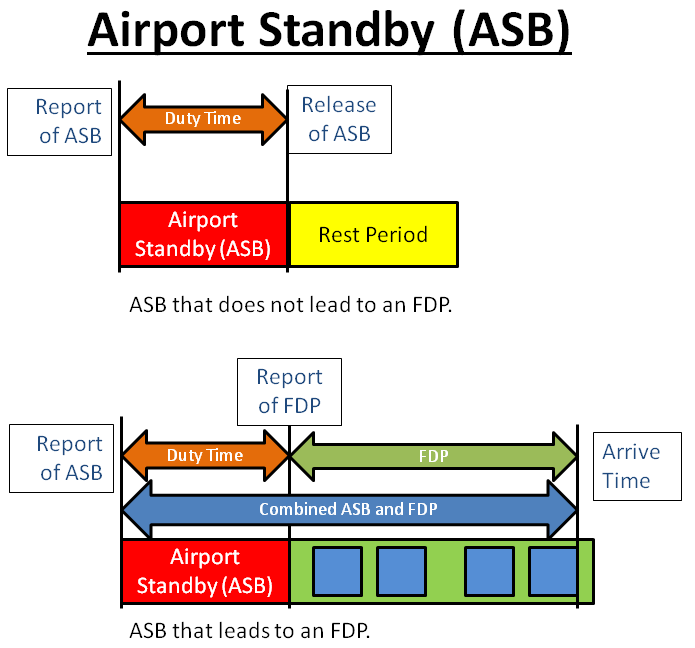 1) The maximum time on ASB or Combined ASB & FDP is 16:00, when not assigned to a Split Duty or an FDP extended with Inflight Rest. 2) The maximum time on FDP is reduced by the amount of time on ASB in excess of 4:00. 3) A CM assigned to an ASB that does not lead to a FDP must be released into a rest period in accordance to the rest requirements under ORO.FTL.235. 4) All time on ASB/Combined ASB & FDP counts towards the Cumulative Duty Limitations under ORO.FTL.210. 1) The maximum duration of OSB is 16 hours. 2) The operator’s standby procedures are designed to ensure that the combination of OSB and FDP do not lead to more than 18 hours awake time. 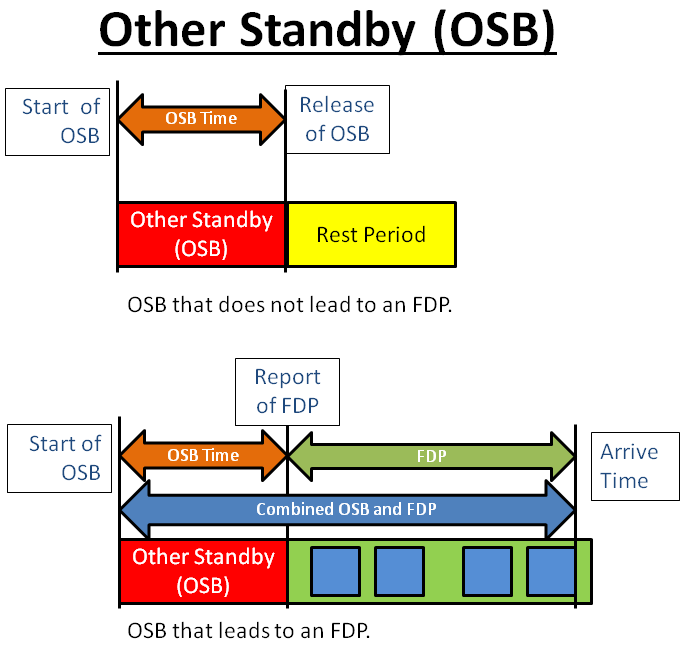 3) 25% of time spent on OSB counts as duty time for the purpose of ORO.FTL.210 only if the OSB leads towards a FDP without an intervening rest period. 4) OSB is followed by a rest period in accordance with ORO.FTL.235. 5) OSB ceases when the crew member reports at the designated reporting point. 6) If the OSB ceases within the first 6 hours, the maximum FDP counts from reporting. 7) If the OSB ceases after the first 6 hours, the maximum FDP is reduced by the amount of SBY time exceeding 6 hours. 9) If the OSB starts between 23:00 and 07:00, the time between 23:00 and 07:00 does not count towards the reduction of the FDP under (6), (7) and (8) until the crew member is contacted by the operator. The minimum time from the time a CM is notified until the CM is required to report for a FDP, ASB or start an OSB is 10:00. A CM assigned to RSV must meet the rest requirements for Extended Recurrent Recovery Rest (ERRR) under ORO.FTL.235(d).